This is becoming a regular post for me, I do hope that my followers find it interesting? So here are my weekend purchases. 9 Bar - I buy these regularly. Due to my allergies running to the newsagent for a chocolate snack is not an option. 9 Bar is free from egg, dairy, gluten, lactose, wheat, yeast. There are five varieties – pumpkin, organic, original, flax and nutty (my personal favourite). A 9 Bar is made from seeds and nuts and the best part is a carob topping (except pumpkin). Carob is an alternative to chocolate so you will often find dairy free ‘chocolate’ bars made from carob. It has a sweeter taste than cocoa. During my childhood carob was my only option as a replacement for chocolate so I have a fond love for it but I know it is not to everyones taste. You can purchase 9Bar online, Holland & Barratt and most Supermarkets. Dragonfly Soysage - These are Vegan, Gluten, Egg and Dairy free, it can be difficult to find tasty egg free veggie burgers and sausages but these are great. There is also a range of Beany burgers which are very tasty. I buy them from Holland & Barratt. 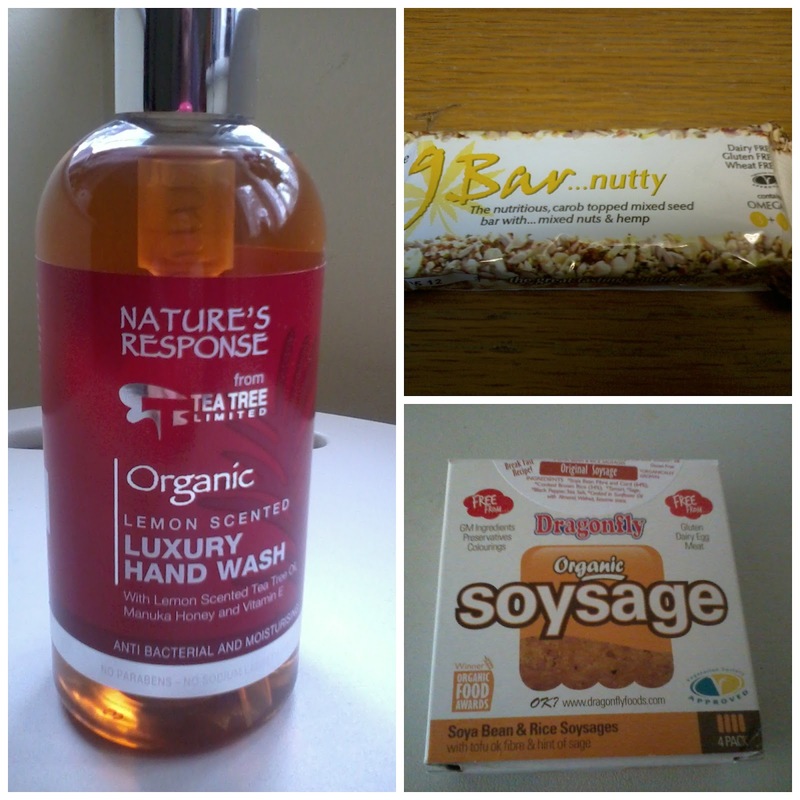 Nature's Response Lemon Scented Hand Wash - This was another TX Maxx discovery for £2.99. I went to a different store this weekend and it was not as good for beauty as the last one I went to. 100% chemical free products are not always readily available on the high street but often you can find items with reduced chemicals. Obviously 100% chemical free is my preferred choice but sometimes budget, online delivery charges or convenience over rule my purchase decisions. In the case of this hand wash it is paraben and SLS free and not tested on animals. It is hard finding 100% natural products in a lot of stores. I work in a supermarket and we have maybe 1 or 2 brands which are 95+% natural but even then that's only half a dozen products. For quite a few things, I have to go to a health food store. Hopefully that will change one day and supermarkets and health food stores can be integrated. I'm confused with the hand wash though, it says Organic but it's not even 100% natural? I hate when companies say things like that. I once found a product that said "Certified Natural" on it. @MissTeaAddict - most of my natural favourites are purchase online here in UK choice in health food shops is very limited. Organic labelling is confusing and there are loop holes from what I can understand from the website for the handwash the tea tree and manuka are the organic ingredients in this product. I find these helpful especially with gluten-free item as my sister has celiac disease.